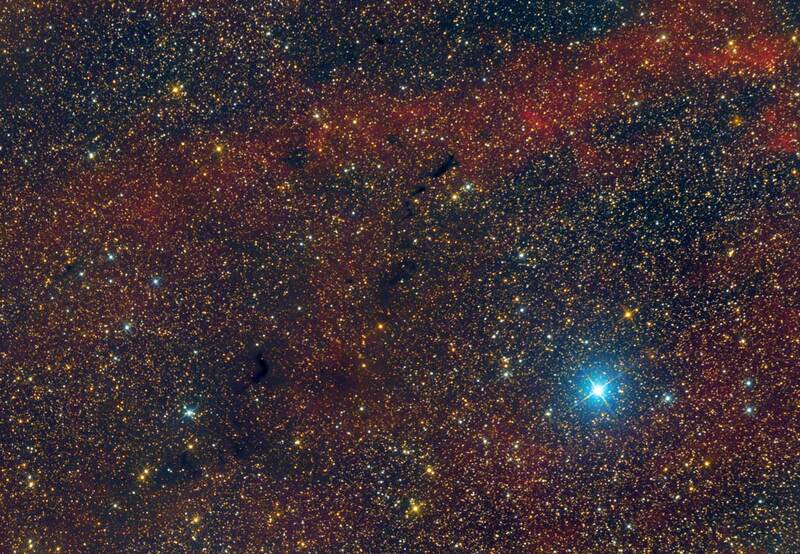 Sh2-119 is an emission nebula in the constellation Cygnus. It lies about 2 degrees to the west of the North America Nebula, or 9 degrees west of the bright star Deneb. It seems to wrap around the fifth magnitude star 68 Cygni (HD 203064). Its shape looks like two shells that are arranged to the east and west of 68 Cygni; the eastern part is the most extensive. In the southern part of the nebula they are visible thin filaments and cocoons of dark nebulae (see the annotated mouseover), which contrast strongly with both the glow of the nebula and the rich starfield background. The distance to Sh2-119 is estimated to be about 2200 light years from us.